Wallpaper with cute rows of houses as a motif is actually pretty common - there's Bloomsbury, St Ives, Brighton. I love designs like this - they're simple, they're quirky without being too twee and I've always really liked outdoors indoors design. 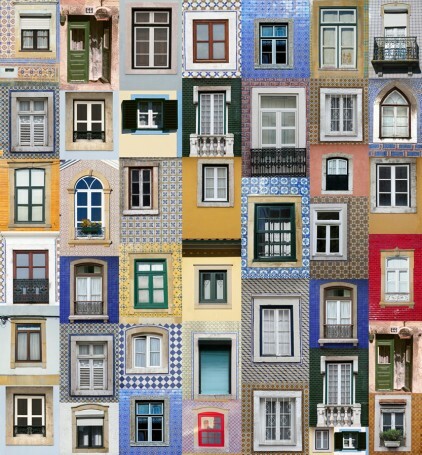 Oh Wallpaper's Portugal design is along the same theme and it's delightful. Usually when I see a design inspired by Europe, it's got the Eiffel tower stamped all over it. It's refreshing to see something a little bit different, and these little Lisbon window frames make for a gorgeous paper design. You can choose to have a mural with sheets for £180 (as much as I hate the term 'feature wall', I think it would work), or you can go all out and buy the rolls for £90. 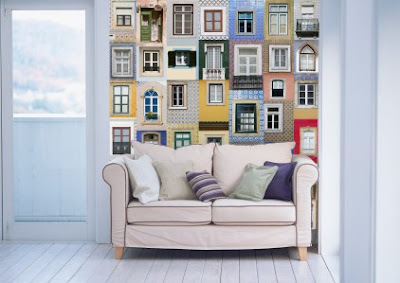 The Portugal wallpaper is available from Bouf, which now has a sign-up feature and promises lots of sales and discounts so head there to find out more. If you just fancy a nosy at some pretty wallpaper, head to the Oh Wallpaper website instead.